I stood back and looked at the board. Over fifty names. After the first fifteen I’d started to worry, at twenty-five I was stressed and by the end frustrated beyond belief. Over fifty names. Because I’m a nice teacher, I’d asked my class, who were a wonderfully opinionated and forthright bunch, for names of famous people throughout history whom they would like to learn more about for our ‘Heroes and Villains’ topic. We’d start with a literacy lesson on writing a biography. Every child offered two names. Not one picked a woman. Not even the girls. My class had slightly more boys than girls, but the girls ruled it. They were a mixed bunch – from the seriously wealthy to a single parent family with six children living well below the poverty line – but I’d spent two years with them and encouraged them to be critical thinkers, independent and confident in their own self-worth. So, imagine my consternation when every single person they wanted to learn more about was male. Over fifty of the most inspiring people (to them), the great names who’d piqued their interest, and not a woman amongst them. Now… I’m male. All through my own schooling I don’t think I ever noticed that almost everyone we ever learnt about, especially in history, was male – with the exceptions of Queen Elizabeth and Queen Victoria, of course. But when I became a teacher I resolved to ensure that my classes would learn about people from outside the straight, white & male model I’d had. Hence, when doing code-breaking in maths, my Year 5 class learned about Anne Lister, a lesbian who wrote her diaries in code. When doing speech writing, besides Martin Luther King (obviously!) we studied abolitionist and women’s rights activist Sojourner Truth. When doing physics we looked at Marie Curie. In geography, Amelia Earhart. Inventors? Mary Anderson (windscreen wipers) and Stephanie Kwolek (Kevlar). Yet, when I stood in front of the names of fifty men on the board and asked my class, and teaching assistant, why I was surprised, I was met with blank looks. It wasn’t until I pointed out that they were all men that I got any reaction at all. That reaction was a shrug. Essentially it came down to two things. Despite my efforts, apparently most of the class hadn’t thought of any women when I asked for people they wanted to know more about. Those that had thought of suggesting women declined when it came to the crunch, because they thought their contribution hadn’t been important enough. Not important enough. At age ten, these girls had looked at the contributions of women throughout history and decided that they weren’t as important as men – some of these men, by the way, were Jeremy Kyle, Jeremy Clarkson and Nigel Farage. Trying to dig deeper with ten year olds proved fruitless. People like to assume that we, as teachers, have this wonderful influence on children, but my class had had a series of intelligent, caring and brilliant female teachers before I arrived. So where did idea that women aren’t important come from? The girls in my class looked up to popstars, athletes (even if they didn’t know their names) film stars and Disney princesses. They were less impressed by the Queen. That suggestion came from an earnest young man and was met with derision from everyone else. So where do I go from here? Well. I’ve a new topic starting this week called ‘Gallery’ in which we’re looking at art and art styles. Alongside Govian directed Western Male Artists, my classroom is covered in works by Frieda Kahlo, Yayoi Kusama and Georgia O’Keeffe. Photo description: The photo is by Adam Kerfoot-Roberts and is licensed under the Creative Commons Attribution-Share Alike 2.0 Generic license. 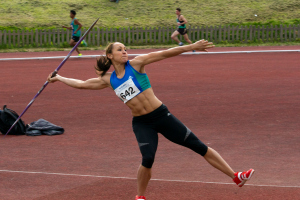 The photo is of Jessica Ennis-Hill (then Jessica Ennis) competing in the javelin event at the Yorkshire Track and Field Championships 2012 at the Dorothy Hyman Sports Centre, Cudworth, South Yorkshire on 13 May 2012. She is about to throw a purple javelin, her competition entry number is 642, and she has an incredibly focused and determined look on her face – eyebrows up, lips pursed, right arm back ready for the throw, left arm forward pointing in the direction she wants the javelin to travel. Her left leg is off the ground, and every well-toned muscle is visibly working hard. She is using ALL of the physics, she’s wearing red and white trainers, and she’s about to win the county javelin championship. G* has been a primary school teacher for five years, training first in Scotland and now working in the North of England. Before that he worked in a number of national retail establishments after finishing his (really useful) degree in sociology. In his spare time he enjoys stand up comedy, reading and fine-tuning his zombie apocalypse survival plan. He can often be found cooking up wonderful meals before ruining them in some culinary disaster and eating hula hoops for dinner instead. G* has been an active member of the LGBT community through volunteering and activism work and has supported the feminist movement by shutting up, listening and speaking out when appropriate.